High Availability. Disaster Recovery. Total Flexibility. 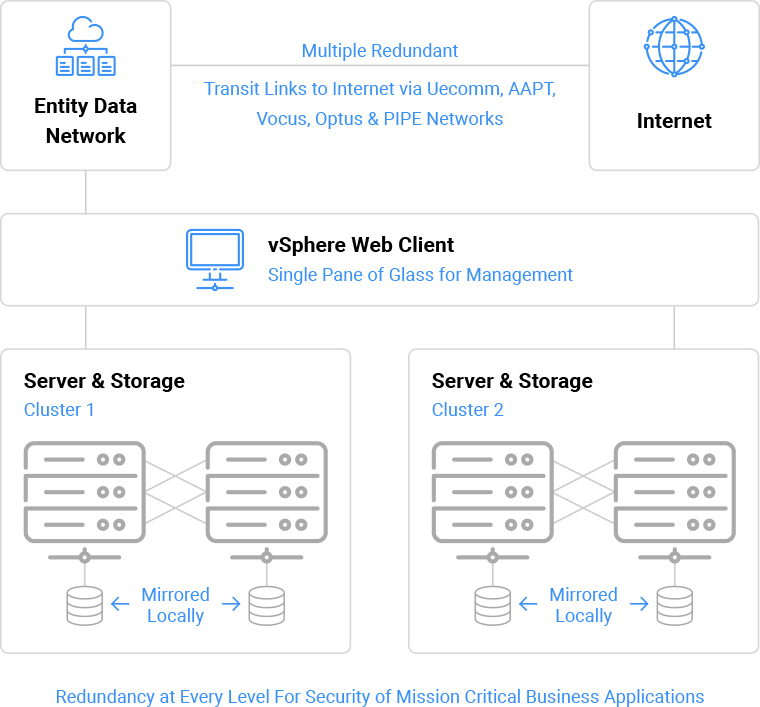 Entity Data’s Managed VMware Cloud provides the highest level of virtual server infrastructure availability by leveraging on our fully-redundant and geographically distributed VMware cloud platform. As a VMware Premier Partner, we are running a world-class virtualisation solution capable of delivering high levels of performance and reliability. Our platform has been designed without any single points of failure, meaning no single component failure can cause an outage. We can accommodate almost any technical requirement and can build a solution to meet your specific operational needs. When downtime isn’t an option, and you need the absolute highest levels of availability, Managed VMware Cloud is the solution for you. Choose between Standard Care and our more comprehensive Critical Care SLA. Our Data Centres, Network and Hardware are fully-redundant with no single points of failure. Daily Onsite, Daily Offsite and/or Continous Data Protection provided via our Veeam backup Infrastructure. Multi-gigabit, Multi-homed, all Cisco network (AS56057) providing blistering fast performance and maximum resiliency. E-ticket or Telephone. Guaranteed 15 minute business-hours and 45 minute after-hours response on (P1) Urgent priority tickets. VPN, Firewalling, Intrusion Prevention, Reverse Proxy, 2-Factor Authentication, Private VLAN and remote management options through vSphere Web Client. Our platform has no single points of failure and is geographically redundant. High performance enterprise SSD storage powered by DELL EqualLogic. We guarantee less than 5.26 minutes of unscheduled downtime per year! Upgrade or downgrade your resources as needed – our resource billing is flexible. We can install almost any Operating System you require. Our support team is available 24/7/365 via telephone or ticket system. * Approx. 3 months backup retention.